The cédrat fruit is really interesting. It's part of the citrus family, but grows to be a lot bigger than all of its lemony orange cousins (25 cm long and 3kg in weight). They grow in Corsica, which is a beautiful island off the coast of Italy. This fruit is also used to make candied fruit and liqueur. The shower gel in this line comes in classic and functional packaging, which looks very sleek. It doubles as a refreshing shampoo and one bottle should last around 2-3 months since you definitely don't need a lot to get a good lather. Joseph says: "It has a nice smell and works well for both body and hair. And I really like the bottle, if that counts for anything. My hair and skin weren't too oily or dry after using it." 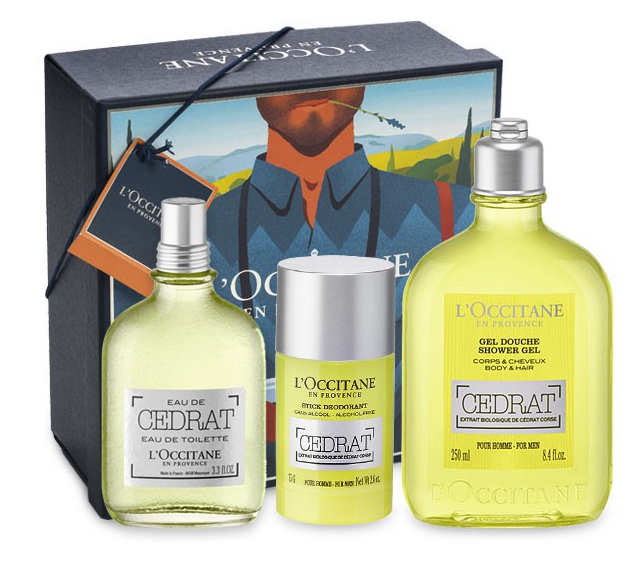 "The multi-benefit CEDRAT skincare range answers the daily needs of young men's skin: it hydrates, mattifies and energizes." The After-Shave Cream Gel is both a moisturizer and calming after-shave in one. It has the same woodsy-citrus fragrance and feels so luxurious on the skin. The cédrat fruit in the formula works to even out the skin's tone and texture overtime, just like many other acidic fruits. Here's what Joseph thinks: "the after-shave has a nice light scent that isn't overwhelming. The texture is also good, really soft and not oily." As you can tell by now, the CEDRAT line has been a big hit over here. Since the products are quite gentle with a natural fragrance, I can't see how anyone would dislike them. I love the idea of frequent holiday-based collections, so if you haven't seen it already, be sure to check out the gorgeous Mother's Day Iris line which I had featured back in May.